As a core component of our meta strategy we want to use a robust technical model. The way its signals are translated into concrete allocation decisions is influenced by the fundamental state of the economy. Price based tactical asset allocation strategies are a popular way to systematically decide how much of your portfolio to hold in cash and which portion to invest in a particular risky asset at any given time. These strategies have historically shown to successfully reduce risk (through lower volatility and drawdowns) with returns at least on par with the dominant risky asset – equities. This is traditionally done by looking at your portfolio once a month and only investing in assets in a long term up-trend, often choosing the ones with the highest relative strength. There is a lot of independent evidence that these strategies are a very good way to improve on a buy & hold approach, that had to sit through massive drawdowns that have lasted well over two decades in real dollars (including inflation) in the past. 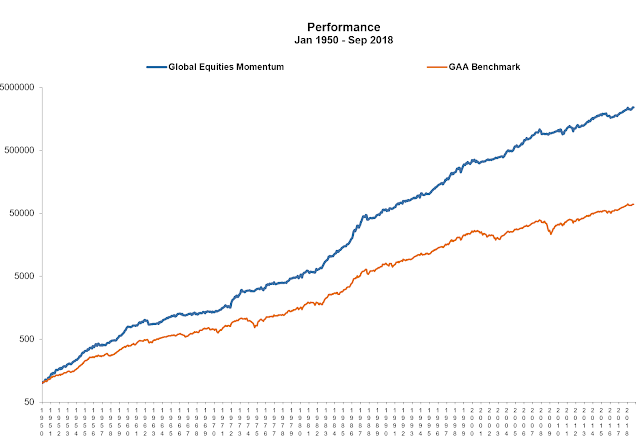 Strategy rules, charts and backtests from Gary Antonacci: Extended Backtest of Global Equities Momentum. Antonacci´s backtest show very high returns and low drawdowns (only 1/3rd of the S&P´s maximum drawdown). Because of the low number of historic major drawdowns, random luck may play a considerable role in this. For example, the 1987 Black Monday crash was completely avoided, but, if an event like this should happen a little bit faster in the future, all technical strategies will be hit by it due to their reactive nature. I would always include a what-if-scenario of a worst case event in my expectations to be prepared for it. Returns for tactical asset allocation strategies usually rely heavily on the equity risk premium. When stocks go up they make money, if stocks go down the portfolio´s drawdowns are reduced by rotating into bonds. Diversifying across additional asset classes (commodities and real estate) further reduces volatility, but also introduces more complexity and often drags down returns. Practical implementation of these purely technical strategies often leads to frustrating whipsaws in and out of equities. Price based signals are actually wrong so often, that this reduces returns most of the time – basically they tend to underperform in bull markets, which make up the majority of our investing lifetime. Behaviorally these seemingly pointless moves (from our perspective in real time) in and out of different securities can easily lead to an abandonment of a strategy, that looks very robust and sensible on paper. Conversely tactical asset allocations more than make up for this underperformance by avoiding the bad bear markets, that really destroy investor confidence – if one manages to stick to the strategy through the long bull periods of the market. A good strategy is one that you can stick with in practice – over several market cycles. Because we, as human beings, tend to have a problem with being wrong more often than right, it makes sense to me to try to improve the probability of being correct by adding fundamental ideas to a tactical asset allocation strategy. In general all technical measures you like to use can be integrated in the meta strategy. I would suggest sticking with measures that can be calculated from price data objectively – for example moving averages, absolute momentum, RSI, Bollinger Bands etc.. In contrast to patterns drawn on a chart subjectively – e.g. trend lines, head and shoulders, double bottoms etc..
My preferred indicators are based on long-term practical results and backtests, as well as my assessment of what technical characteristics best describe different market regimes. Short-Term Momentum (1-month) – exhibits a reversal in returns. Intermediate-Term Momentum (3-15 months) – exhibits a continuation in returns. Long-Term Momentum (1 to 5 years) – exhibits a reversal in returns: Trends start to break down as mean reversion takes over and the market returns to fundamental values and often overshoots. 2 Volatility clusters – all the way back in 1963 Benoit Mandelbrot observed a certain pattern in volatility variation, which he summarized as follows: ”Large changes tend to be followed by large changes – of either sign – and small changes tend to be followed by small changes”. This is especially pronounced in low volatility environments. As low volatility regimes are usually coincident with up-trending markets and high volatility regimes with markets moving down, a clustering of volatility points to a persistence of trends. 3 Fat tails and return asymmetry in financial price series – returns, especially of stocks, exhibit fat tails (meaning non-Gaussian, sharp-peaked and heavy-tailed distributions – with a higher probability of extreme returns) and negative skewness (an increased probability of big losses, because of a fatter tail on the negative left side). This implies, that a method that protects by cutting losses before the fat left tail (e.g. a stop loss or a trend method), can earn above average risk-adjusted returns over time. Green: S&P 500 Price is above the 275MA and the VIX Term Structure is in contango (further out VIX futures are more expensive than the ones closer to expiration): the „normal” state of things that we are in more than 75% of the time. Yellow: the S&P 500 Price falls below the 275MA and / or the VIX Term Structure inverts into backwardation (2nd VIX future is more than 1,5% cheaper than 1st). Red: The 60MA crosses below the 275MA or the VIX Term Structure moves into strong backwardation (2nd VIX future is more than 9% cheaper than 1st or it is in backwardation for more than five trading days). Stop Loss Trigger: if both red conditions are fulfilled at the same time, then I move to safety as a precaution. Results are similar to other tactical allocation strategies, because different trend and volatility measures often trigger warnings around the same market events. Three different warning stages can be used to adjust exposures more gradually than the binary black and white decisions of most other tactical strategies – reducing the effect of the frequent whipsaws we can expect to happen. Implementing a technical tactical asset allocation is quite powerful on its own, but adding fundamentals leads to an even more nuanced way of reacting to each signal in practice – reducing the impact of incorrect warning signals.